In this tutorial we explain you how to add further serial interfaces to your SAMD based board; these interfaces are hardware based and can be I2Cs, UARTs or SPIs types. This is possible because the SAMD microcontroller has six internal serial modules that can be configured individually and just four of them are already configured; the other two are available for mapping onto specific pins and in this tutorial we explain you how to do it. Only your Arduino or Genuino Board is needed for this example. 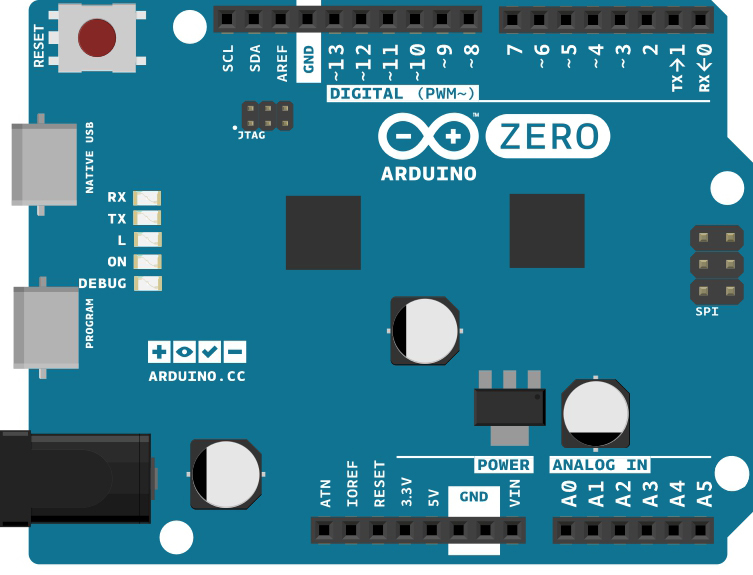 One of the advantages of the Arduino platform is the simplification of the hadware, assigning to each microcontroller pin one of the many possible functions. You can find the various functions assigned to each pin in the variant.cpp file of each board. Let's see, for example, the MKR1000 one. As you can see, SERCOMs can be routed almost everywhere, having more than one SERCOM routable on more than one pin. Let's now try to use the table above to add a new interface to our MKR1000 board. As we can see the pin 0 and pin 1 can be driven by two SERCOMs. In particular by SERCOM3 and SERCOM5. Well looking at the SAMD21 datasheet we can figure out that the SERCOM PAD0 can be used as SDA and the SERCOM PAD1 as SCL so, we can do this using the example below. must be put in the setup() in order to override the standard Arduino pin assignment for this board (digital I/O) and to allow the SERCOM to drive them. instead is used to allow the real I2C communication since the Wire library relies on interrupts. Reads an analog input on pin A0, prints the result to the serial monitor. Attach the center pin of a potentiometer to pin A0, and the outside pins to +3.3V and ground. must be placed in order to override the standard Arduino pin assignment for this board (digital I/O) and to allow the SERCOM to drive them. instead is used to allow the real Serial communication since the Serial library relies on interrupts too.